The section on Accretion identified a force far stronger than gravity that is responsible for the collapse of dusty plasmas into stars, planets, & moons. Now we can examine the dynamics of this process. Recent research has shown that giant molecular clouds first resolve into linear filaments, and then the filaments collapse into stars.1,2,3 (See Figure 1.) The Universe is actually full of filaments of various sizes and shapes.4,5 Both gravity and hydrostatic pressure object to this form, leaving only EM as the driving force. 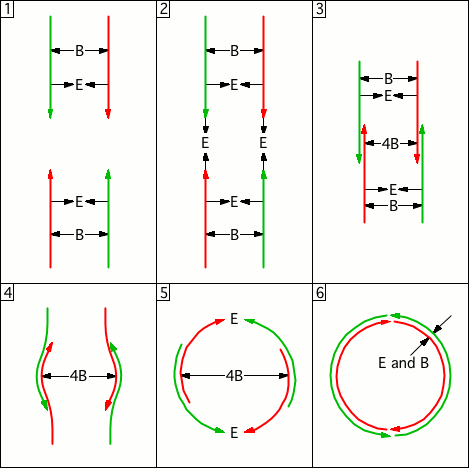 Some EM theorists have generalized the concept of Birkeland currents to explain the prevalence of filaments, but without establishing the electromotive forces at play, and without demonstrating that the currents would require material filaments. An electric current actually prefers a vacuum,6 and would evacuate the material in a filament by ohmic heating. So electric currents neither prefer filaments, nor cause them. Rather, the filaments are caused by their electrostatic properties. Figure 1. Taurus Molecular Cloud, courtesy Astrochemical Surveys At Iram. Figure 2 shows a random distribution of charges, where the connecting lines show electrostatic attraction between opposite charges. That is the source of the "like-likes-like" force. But notice that there is repulsion in that configuration, between like-charged dust grains, and between like-charged +ion clouds, where lines of force from like charges collide with each other. Now look what happens if the spherical dusty plasma is stretched into a filament, as in Figure 3. There is no repulsion anywhere in that configuration! All of the electric lines of force close on the nearest neighbor, which is oppositely charged. So it's all attraction and no repulsion. From this we can conclude that the net attractive force in the linear configuration is much greater, and thus the chances of accretion are much greater. So it makes sense that spherical dusty plasmas don't tend to collapse, but if the plasma resolves into filaments, the chance of collapse is much greater. Figure 2. Attraction & repulsion in a random distribution of charges. Figure 3. Purely attractive forces in a linear configuration. Figure 4. Debye sheaths stretched into comas by friction. 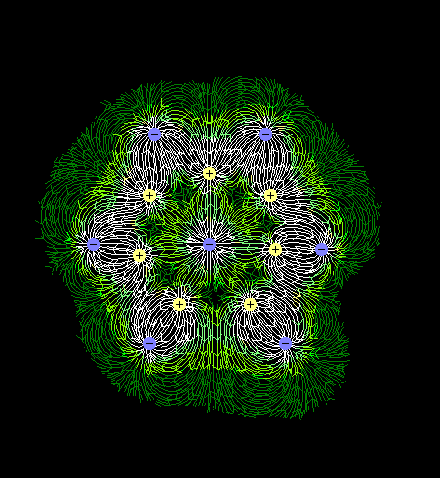 Then we just have to look for things that would encourage filaments to form, and then the rest happens automatically. This is expected in the collision of two gas clouds — the friction will be relaxed if they resolve into jets that tunnel through the opposing clouds. As they do, they'll stretch the Debye sheaths into comas, as in Figure 4, establishing a linear body force. So hydrodynamic jets produce electrostatic filaments. Once formed, they'll snap together. In other words, it's like grabbing a balloon that wasn't ready to "collapse" and stretching it into an oval with a high aspect ratio, creating a force that wasn't there in the resting condition. If we let go, the balloon will implode toward the center in a bidirectional linear motion, rather than a radial one. Note that on a larger scale, the entire filament might not implode on just one point — the filament might break into segments that individually collapse into stellar systems, like beads on a string.7 There will be no guarantee that the stars will be perfectly spaced, or all of the same size, if there is no guarantee that the weak points in the filaments were evenly spaced. On an extremely large scale, such as the stellar nursery in Figure 5, just the outsides of the tunneling jets are in contact with the surrounding matter, so that's where the Debye cell collisions are. And that's where the stars are forming. So where there is friction between the gas clouds, filaments are formed (not visible in Figure 5) that are parallel to the direction of the jets, which collapse into stars. Figure 5. 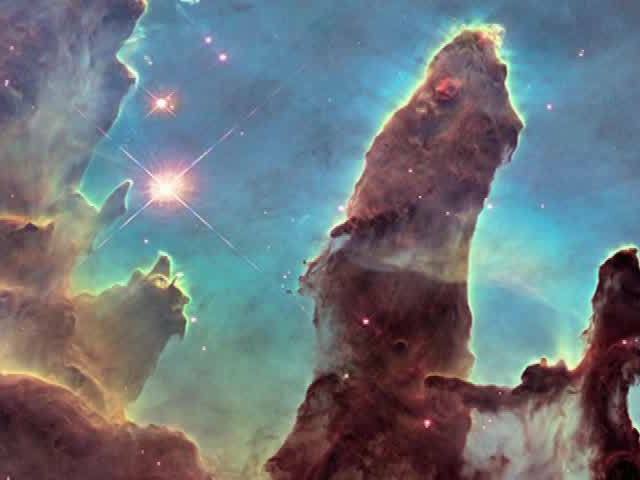 Pillars of Creation in the Eagle Nebula (M16). Figure 6. Moving charged particles generate magnetic fields (i.e., Ampère's Law), with a polarity that obeys one of the right-hand rules. 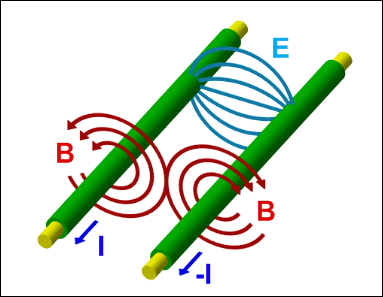 Like-signed charges traveling in opposite directions generate magnetic fields of opposite polarity, which repel each other, with a force proportional to the velocity. The like charges also repel each other for electric reasons. The next step is to consider the electrodynamic forces that will come into play. Insofar as the attractive body force is generated by ions, we have charged particles moving in a line toward the center. This constitutes a linear electric current of sorts. Thus it isn't that electric currents cause the filaments — it's that the filaments themselves are the currents. But note that the current isn't all going in the same direction — in an imploding current, the two halves of the current are moving in opposite directions toward the center. And while moving charged particles generate magnetic fields, like charges moving in opposite directions generate fields that repel each other. (See Figure 6.) This has many implications, which need to be considered in turn. First, let's derive the expectations if we can assume perfect symmetry in the line of plasma that is imploding. At the center, the plasma isn't actually going to collide violently — the opposing magnetic fields will brake the plasma. And note that the strength of the magnetic fields is proportional to the velocity. This has its own significance. Imagine shoving two bar magnets together, with their like poles facing each other. 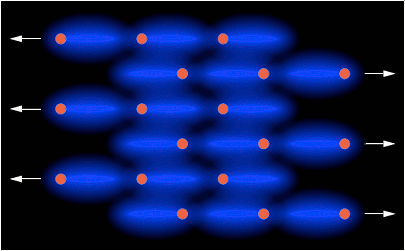 Without the magnetic fields, the two bars would collide. With the magnetic fields, the bars might never actually come into contact with each other — the magnetic force might get the bars to bounce off each other. But what if the magnetic force relaxes as the two bars are decelerated? They won't collide violently, but they won't bounce off of each other due to magnetic repulsion either — rather, they will collide gently. Now imagine that these are two plasma streams colliding — they won't pancake, or tunnel through each other — they'll just get to the center and stop, whereupon gravity will take over, and accomplish the final consolidation of matter into one big star. Figure 7. 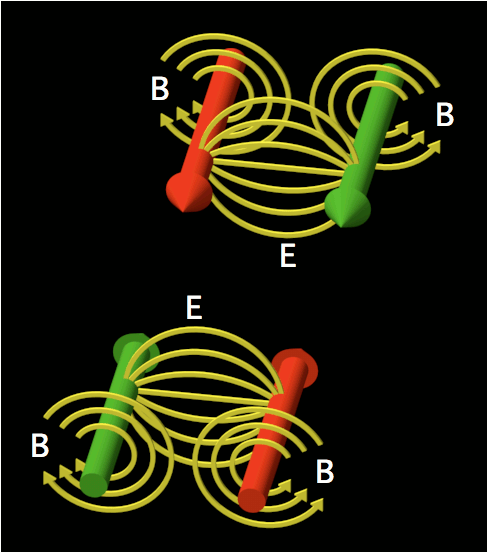 Opposite charges (I) traveling in the same direction generate opposing magnetic fields (B). At relativistic speeds, these approach the strength of the electric field (E) that attracts the opposite charges. On closer scrutiny, the formation of one big star at the implosion point isn't the only possibility. Each half of the filament is net neutral, meaning that both positive and negative charges are present. And just as like charges traveling in opposite directions generate magnetic fields that oppose each other, the same is true of opposite charges traveling in the same direction. (See Figure 7.) A subsequent section (i.e., Energy Budget) establishes that the collisional velocity could be as high as 0.86 c. Approaching the speed of light, the magnetic force becomes as powerful as the electric force. The significance is that we can expect to see charge separation within the imploding streams, due to the magnetic force.8 Thus it isn't going to be two halves of a filament imploding as two streams of plasma, all with the same charge — each half will be made of two parallel streams, one positive and the other negative. So in total, there will be four different charge streams — two positive and two negative, with one pair coming in from one direction, and with the other pair coming in from the other. (See Figure 8.) The implication is that the two positive streams will repel each other, for both magnetic and electric reasons, and likewise for the negative streams, but oppositely charged streams will not have any magnetic repulsion between them, and the electric force will be attractive. (See Figure 9.) Hence the positive stream coming in from one direction will split off and collide with the negative stream coming in from the other direction. The two collisions will be braked partly by nearby opposing magnetic fields (just not as much as they would have been in a head-on collision) and by particle collisions when the opposing streams fuse. The result will be two stars, of roughly the same size. Figure 8. Two colliding halves of a filament. Each half has a positive (green) and a negative (red) stream, with an E-field between them, while the B-fields keep them apart at relativistic speeds. Figure 9. Nearing collision, the E-fields get re-aligned between the colliding streams, pulling them together. Once the streams begin tunneling through each other, the E-fields go away, but the B-fields are quadrupled, as the sum of the fields from the positive and negative charges. This is a non-trivial property of the present model. Roughly 1/3 of all stars have binary companions,9:155 most of which are very near in size. (See Figure 10.) This is typically attributed to fragmentation of the giant molecular cloud from which the stars condensed.10:355 But no plausible mechanism has been proposed to account for such an even split. And for the binaries to end up in close proximity to each other, both halves must implode toward each other, forming stars right at the boundary, which is a theoretical problem that isn't even directly addressed. The present model explicitly allows the formation of one large star, or two small stars of roughly the same size, leaving any other combination as the rare exception, which is consistent with the statistics. Our Sun might be an example of the former case (i.e., one large star instead of two small ones), having no binary companion, and being 2~3 times larger than most binaries. Figure 10. 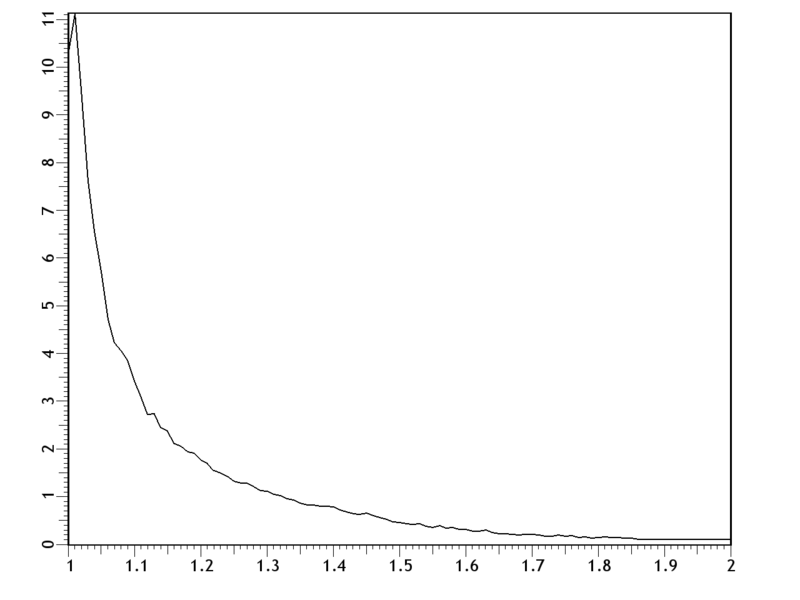 Comparison of the magnitudes in binary systems (per the Washington Double Star Catalog), showing that most binaries are within 10% of the magnitude of their companions. Once the two halves of the filament collapse into two stars, there will be no guarantee that they will remain in proximity to each other, forming a binary system. If the implosion loses little energy to magnetic braking in a near-perfect head-on collision at the center, the newly formed stars will move away from each other far too quickly for mutual gravitational capture. If so, the result will be two singletons careening through the interstellar medium, instead of one binary system at the center of the original dusty plasma. Thus it's possible that more stars form as binaries, but only 1/3 of them stay associated. Figure 11. Toroidal plasmoid formation. 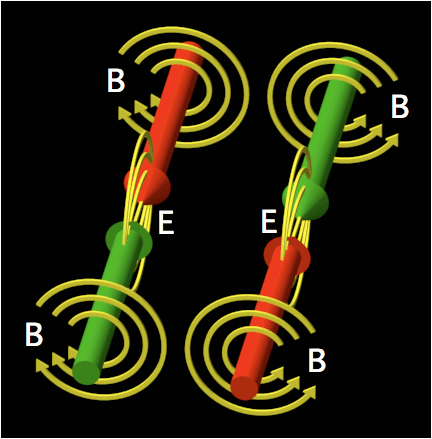 The arrows for the positive & negative charge streams (green & red) show the direction of the particle motion, while the arrows for the B & E fields are outward for repulsion and inward for attraction. Two charged-separated halves of the filament approach each other (as depicted earlier, in Figure 8). Opposite charges are steered toward head-on collisions, for both electric and magnetic reasons. 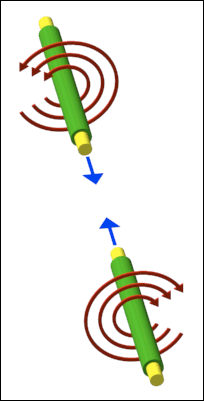 Nearing the collision, an E-field develops between opposite charge streams, pulling them together (as depicted earlier, in Figure 9). 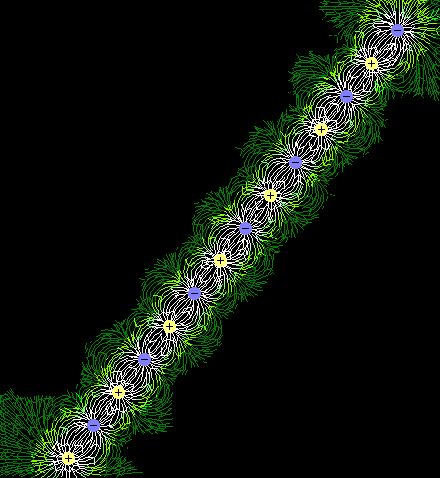 As the streams burrow through each other, the electric force is satisfied locally, so there is no longer any attraction between the strands in that segment. But the B-field between the strands gets quadrupled, because two repulsions have been doubled. The lack of an attractive E-field, and the quadrupled repulsion from the B-fields, force the strands to bulge outward. The effect is the greatest where these factors have been present the longest (i.e., where the collision first started). If the charge streams successfully burrow all of the way through each other, and continue out the other side, due simply to their pre-existing momenta, an E-field between the opposite charges gets re-established, steering the streams toward each other. The B-fields generated by the opposing streams (not shown) also favor a head-on collision, as they did in the first panel. The four individual charge streams finally resolve into a continuous loop. There will be a toroidal magnetic field wrapping around the annular axis that will keep the streams organized. Electrostatic repulsion between like charges will distribute them evenly around the loop, while attraction between opposite charges will keep the opposing streams bound together. Electrical resistance between the counter-streaming positive & negative charges will reduce the relative velocity between them. As this happens, the toroidal magnetic field will relax, eventually to the point that the toroid will fall apart. But starting with extreme angular speeds, the plasma will be a near-perfect conductor. So it will take a long time for electrical resistance to slow down the plasma. In a much shorter period of time, the toroid would fall apart due to the centrifugal force from the extreme angular momentum. There will also be an outward force from the compression of the toroidal magnetic field on the inside of the loop. Both of these factors would tend to increase the radius of the toroid. There will be no centripetal force per se, but there will be a tensile force running through the charge streams that will prevent the radius from being increased. The section on Accretion established that in charge-separated matter such as plasma, there is an electric body force pulling inward. If the plasma is in annular form, this would be more properly called an annular tensile force. With this trying to decrease the radius, and with the centrifugal and magnetic forces attempting to increase it, the radius will stabilize when all of the forces come into equilibrium. Possible evidence of such a toroidal plasmoid is cited in the section on Supernovae, and the star in question (i.e., Mira) appears to have a major radius equal to the orbit of Pluto around the Sun. 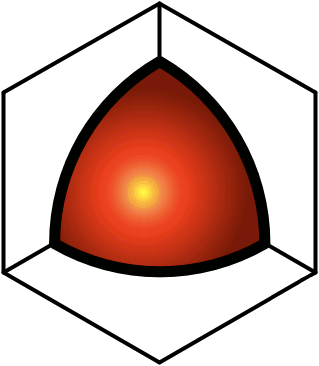 If Mira has the same volume as the Sun, though in toroidal form instead of spherical, the minor radius would be 3486 km (i.e., roughly equal to the radius of Mars). Roughly 90% of the stars in the Universe are in the main sequence, and are probably spherical, like our Sun, while 10% of the stars have a fundamentally different property set. These stars include quasars, blazars, magnetars, pulsars, white dwarfs, and the central stars of planetary nebulae. Subsequent sections demonstrate that many of the properties of such stars are difficult or impossible to explain if the star is a sphere, but easy to explain if it's a toroidal plasmoid. So the present thesis is that all stars are formed by imploding filaments, with 90% of them getting compressed into spheres, and with 10% of them falling into the toroidal form as described in Figure 11.